How the Year of the Ox affects you! Click to jump straight to how the Year of the Ox affects you in 2009! Welcome to the Chinese year of the Ox. Each February marks the beginning the traditional Chinese calendar year. Because of the size of their population this calendar is probably the most followed in the world. 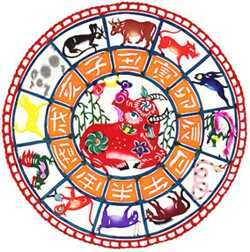 The New Year in 2009 formally commences on Monday 26th January and begins the new Zodiac animal cycle. Chinese tradition always employs both a Solar and Lunar calendar. Using the Solar calendar, it's 5th February, but the New Moon day of 26th January is the official Lunar New Year celebration day when the dragons and fireworks come out into the streets and the Chinese party on. The 26th is a New Moon eclipse day with 6 planets in Aquarius all ready to usher in new and unexpected human-centred events. Solar eclipses trigger world events, sometimes on a massive scale! 2008 was the Year of the Earth Rat and it has been a more challenging and dramatic year than 2007. Now in the cycle of twelve animals comes the quieter and earthy Ox. He's the second sign of the Chinese zodiac. Looking back on my 2008 forecast in my section on Economic Moves I wrote – "2008 is a Yang Earth year, with the Water element underneath. The dominating element is therefore Water. So it's going to be a time of cooling down after the active economic years of 2006 and 2007. Fire is the symbol of financial markets and strong Fire stimulates optimism and speculation. There is no Fire this year and without Fire the market turns conservative." And "...Investors this year will, however, be more cautious and more practical; there will be a cooling down, with more stability in stock markets. With little or no Fire, the Fire industries – finance, the stock market, energy, electricity, entertainment, and airline businesses – will definitely not advance this year. Home and property values will have some support, but with Water underneath, it may be that natural water disasters strongly influence the property market. The solution would be not to buy or invest near seafronts, rivers, large water bodies, or on flood-prone land." I was close, but the dramatic downturn in the finance and banking industry was even more rapid than I foresaw. The Chinese mythology of the Ox (or Buffalo) is a useful tool for finding some insights into this year ahead. Some stories about the Ox – the Ox was born from the very essence and heart of a very old pine tree, a sign of longevity. Lao-Tse, the great Chinese sage, rode astride an Ox during his travels in the mountains in search of immortality. The transcendent Ox is also able to live thousands of years. From one end of Asia to the other the Ox is considered a sacred animal, being an object of veneration everywhere. The Ox figures in Greek and Roman mythology as the bull who was both tireless and who made his way through the mysterious labyrinth as a human's guide. The Ox is born under the double sign of equilibrium and tenacity. Sincere and honest he has much patience, but also has obstinacy and pigheadedness as his characteristics. He achieves prosperity through determination and hard work. He is a powerful one and a born leader, being quite dependable and possessing an innate ability to achieve great things. As one might guess, such people are dependable, calm and modest. Like their animal name, the Ox is unswervingly patient, tireless in work, and capable of enduring any amount of hardship without complaint. Ox people need peace and quiet to work through their ideas and, when they have set their mind on something, it's hard for them to change direction. Ox people are very logical and extremely systematic in whatever they do, even without imagination. They speak little but are extremely intelligent. When necessary, they are very articulate and eloquent. The influence of the Ox shows they are kind, usually caring souls, positive, filled with common sense and with feet firmly planted on the ground. Security is their most important preoccupation in life, and they are prepared to toil long and hard in order to provide a warm, comfortable and stable nest for themselves and families. Strong-minded, stubborn, individualistic, the majority are highly intelligent and don't take kindly to being told what to do. A classic example of an Ox that we all have just got to know is Barak Obama, the new President of the USA, born 4th August 1961. All the qualities outlined in this article are needed in order to be president of the US. Barak Obama has a very good start, as he's born in the year of the Metal Ox. The Ox is a realist, rather than a romantic, and sentiment is not always an important point in an Oxen character. Essential things, such as sleeping, eating, working and keeping promises, protecting possessions and family, are important. The Ox needs to be loved, but is also extremely independent and prefers to organise life in his own way. If you are in love with an Ox, remember that he is full of classic qualities that you attribute to a good husband or wife – faithfulness, seriousness and awareness of family responsibilities. The Ox makes a good cook, handyman and housekeeper. He is sensual in love but the practical side of life can take on more importance. If he marries you, it means he has confidence in you. Often the most important issue then is the handling of finances or the children, rather than a partner's faithfulness or not. and actors: Richard Burton, Keira Knightly, Richard Gere, Charlie Chaplin, Vivian Leigh, and Peter Sellers. What is this Ox Year all about? The previous Earth Ox year was 1949, not long after World War II. The austerities following the war continued well into peacetime, requiring unprecedented rationing. People's religious beliefs were very strong and a form of puritanism swept Britain. Finances for many countries were very difficult. Of great significance was the declaration of the People's Republic of China on 1st October by their communist leader Mao Tse-Tung (Mao Zedong), a new Earth Ox country. Harry Truman became US president; the Republic of Eire was proclaimed; Israel was admitted to the UN; the German Federal Republic came into being; Vietnam was established; India adopted its constitution; and Indonesia was a proclaimed a sovereign nation. Ox years over the last century were 1913, 1925, 1937, 1949, 1961, 1973, 1985, and 1997. Each time a different Chinese Element rules the year, so we had an Earth Ox in '49, Metal Ox in '61, Water Ox in '73, Wood Ox in '85 and Fire Ox in '97. Each of these combinations makes for a different character in that year's personality. For example, in the 1973 year the Water Ox was the type who is more reserved and searches for a calm, harmonious and peaceful way of life. He has to watch the tendency to obstruct emotions and to be careful of psychological bottlenecks in life. A good humanist, good salesman, craftsman and interested in peace, the concern is for family and home. Family life is so very important. The Chinese Yin/Yang balance makes this year a Yin (or feminine energy) Ox year. With Yin Earth over Yin Earth, it's going to be a year concentrating on sensitive and earthy things to do with food, patience, finances, support, nurturing and resources. The Ox year is a often conservative year, one of traditions and values, not a year to be too outrageous. A slow but steady year. This Ox year will bring stability and slow growth, so patience and diligence will pay off. This is a year of harvest, when we reap what we have sown in the past. This applies to the financial crisis the world finds itself in due to past excesses. Those chickens will really come home to roost in 2009. Take care of your business this coming year, do not let things slide. Find some land and start to grow your own, even if it's in window boxes on your verandah or apartment windows. Focus on earth themes – rebuilding, reconstruction, housing, and agricultural to ensure a sufficient supply of food, and make progress in environment repair. Self-sufficiency starts to mean a whole lot more in 2009. The Ox is a complex Earth element. It's not strong Earth this year, as this Ox is winter Earth without the Fire element's support. Inside this Ox hidden elements are Water, Earth and Metal. Water and Metal exhaust the Earth. Therefore Earth in 2009 is not strong and there's instability which can bring earth disasters. The Ox is also part of a serious configuration in animal astrology called the "Three Earth Penalty". This is formed with the three Earth animals – the Ox, Dog and Sheep (Goat), appearing at the same time. It can cause serious instability with the Earth element bringing building collapses, earthquakes, or landslides. In 1997, the last Ox year, Lady Diana died in a car crash inside a tunnel, very much enclosed in an Earth environment. And in the same year, Gianni Versace was shot dead in front of his own house and died on the pavement, also an Earth environment. Both had the Three Earth Penalty in their Chinese astrology. With Yin Earth elements in both parts of the year making soggy Earth, just like after a heavy downpour, this Earth is wet and soft. Soggy earth contains too much water, therefore it cannot hold anything and putting anything heavy on top causes it to sink. However, Earth welcomes the summer (Fire) period (July/August) and with a hot sun shining on it, will not be too wet. Metal industries and the property industry will reach a peak during this period. Earth industries are agriculture, building, ceramics, pottery, farming, nurseries, gardening, mining, storerooms, warehousing (storage) and parking. The basic five Chinese elements represent different parts of the body. Earth in general relates to stomach, pancreas, muscles and cells. Health problems related to Earth could be stomach problems, food poisoning, or diarrhoea. Disorder in the Earth elements can mean problems with muscles and cells, and can bring obesity, diabetes, or cancer. Diabetes is a sickness caused by insulin disorders produced by the pancreas symbolised by Earth element in Chinese medicine. Diabetes is also caused by imbalances in the Earth element. 2009 will see these health problems in focus in the Ox year. For health matters this year, pay special attention to these: related to the mouth, lungs, reproductive organs, bladder, kidney and ears. Terminal illnesses such as cancers will rise, being ruled by soggy or damp Earth in Chinese medicine. In economics, the Fire element is the driving force behind markets. To generalise, Fire is joy/sadness, Wood is kindness/anger, Earth is calm/worry, Metal is giving/grief, and Water is fear/will. Fire years often generate optimism and drive up stocks, as in 2006 and 2007. But in 2008 the Water element arrived and people fell into fear around US mortgage problems and coming recessions. In 2009 it's Earth over Earth. Earth element is not fear inducing like Water and is about calmness – meaning people will stay conservative, playing it safe. So this is a year of continual cooling down, so the markets will not rise and fall as dramatically as in 2008. However, previous Ox years have seen stock markets fall in Asia and the US, so we could expect the same again. In 1973, the Water Ox year, equity markets crashed after the collapse of the Bretton-Woods system, and OPEC imposed an oil embargo which rocketed up world oil prices. In 1985, the Wood Ox year, the Asian Pan Electric Industries company fell into receivership and all market trading was suspended in SE Asia. In 1997 Thailand dropped the Baht's value, causing a financial crisis which triggered a further upheaval across the region. Indonesian President Suharto was forced to step down following widespread riots caused by the devaluation of the Indonesian Rupiah. In short, Ox years have not had a great record with relation to markets and financial moves. Earth industries include property, housing, construction, mining, insurance, and hotels. These will have an active year, as there is hidden Water and Metal in the Ox, symbolising money and productivity for the Earth industries. Unfavourable industrial areas in 2009 are those of Water and Metal. Water industries include shipping, transport, communication, and drinks. Metal industries include high tech, computers, banking, coins, engineering, skin care, and the auto industry. The absence of Fire in 2009 shows this area is not prosperous this year. Click here to read how the Year of the Earth Ox affects you!